Georg Philipp Telemann was born on March 14, 1681 in Magdeburg – the provincial capitol of the Duchy of Magdeburg in Brandenburg-Prussia – to a well-to-do upper middle class family. Unlike Sebastian, Telemann’s family was not musical – most of his ancestors were university-educated and many were members of the clergy. His father died when he was four years old, and he was actively discouraged from pursuing music by his mother and other relatives. Telemann was mostly a self-taught musician, and had taught himself to play violin, flute, zither, and keyboard by the age of 10. He then began lessons with the cantor of Magdeburg, Benedikt Christiani, but when he began to write an opera at 12, his mother – apparently unwilling to let the folly continue – took away all his instruments and forbade him to make music anymore. Telemann attended schools in Magdeburg intended to prepare him for a career in the church like his older brother, and then was sent away to schools in Zellerfeld and Hildesheim (towns in Lower Saxony). Although the primary focus of his curriculum was academics, teachers acknowledged and encouraged his musical gifts, introduced him to music theory, and inspired him to compose music for several Latin school dramas. During this time Telemann also traveled to Hanover and Brunswick and was introduced firsthand to the French and Italian music popular throughout Europe at the turn of the 18th century. In 1701 he went to Leipzig, ostensibly to study law at university. On the way, he stopped at Halle to meet the young Georg Friedrich Händel (whose parents also wished for him to pursue law), with whom he remained a lifelong friend and correspondent. However, once in Leipzig, the law career never panned out: according to the traditional story, one of his room-mates found one of his pieces and arranged to have it performed at the Thomaskirche – one of the oldest and most famous churches in Europe and the church where, 22 years later, Sebastian would begin his 28 year tenure as Kantor. 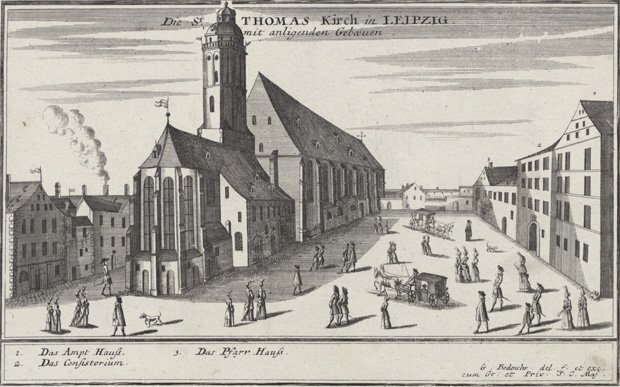 The result of this performance was that the mayor of Leipzig commissioned Telemann to write a new cantata to be performed every other week in the Thomaskirche, and his legal career was doomed. Famously, Telemann founded Leipzig’s student Collegium musicum in 1702, which Sebastian would direct during his years in Leipzig (and for whom it is believed many of Sebastian’s secular cantatas were composed). Also in 1702 (at the age of 21!) he became musical director of the Leipzig Opera, and he composed at least four operas that were performed there in the next 3 years. Telemann’s quick rise to prominence in musical circles threatened the status quo and he made an enemy of Johann Kuhnau, then Kantor at the Thomaskirche, who felt his rights and privileges infringed upon – largely due to the fact that so many student musicians were no longer available to perform at church services because they found working with Telemann at the opera more congenial. Kuhnau’s opposition seems to have had little effect: the city leaders merely forbade Telemann from appearing on the opera stage and Kuhnau continued to have difficulty with the students in the Collegium musicum after Telemann had left town. He left Leipzig in 1705 to became Kapellmeister at the court of Count Erdmann II of Prominitz in Sorau (now Żary in Poland). There Telemann was required to compose instrumental music in the French style to meet his new employer’s tastes, became enamored of Polish folk music on visits to Kraków, and soaked up music of the courts on several trips to Berlin. Telemann left Sorau when war broke out, and after some travels including a visit to Paris in 1707, he was in Eisenach by 1707 or 1708, where he remained until 1712. There he served Duke Johann Wilhelm of Saxe-Eisenach as Kappellmeister as well as Konzertmeister of the court orchestra, In Eisenach he composed industriously: church cantatas, overtures, concertos, chamber music, and music for special occasions. Also in Eisenach, he met Sebastian (who was born there), with whom he remained friends for the rest of his life. When Sebastian’s son Carl Philipp Emanuel Bach was born in 1714, Telemann stood godfather to the child. In 1709 he took a leave of absence from Eisenach and returned to Sorau to marry Louise Eberlin, an attendant to the Countess of Promnitz whom he must have become acquainted with during his previous position there. They returned to Eisenach and she bore him a daughter in 1711, but tragically, Louise died shortly afterwards. Telemann left Eisenach a year later to become the city director of music and Kappellmeister at the Barfüsserkirche in Frankfurt am Main. He was there for more than 9 years. During his tenure in Frankfurt, Telemann composed a copious amount of church music (at least 5 complete cantata cycles), chamber music, orchestral suites, operas, and oratorios. He also married again in 1714: this time, to Maria Katharina Textor, a clerk’s daughter. Through this marriage he became a Frankfurt citizen. In the years to come they had 10 children together – none of whom turned out to be musicians. 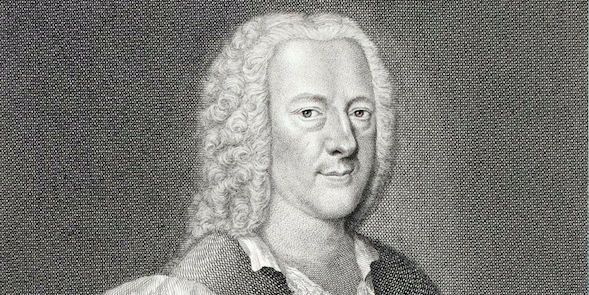 Georg Philipp Telemann ~ Engraving by Georg Lichtensteger, c. 1745. 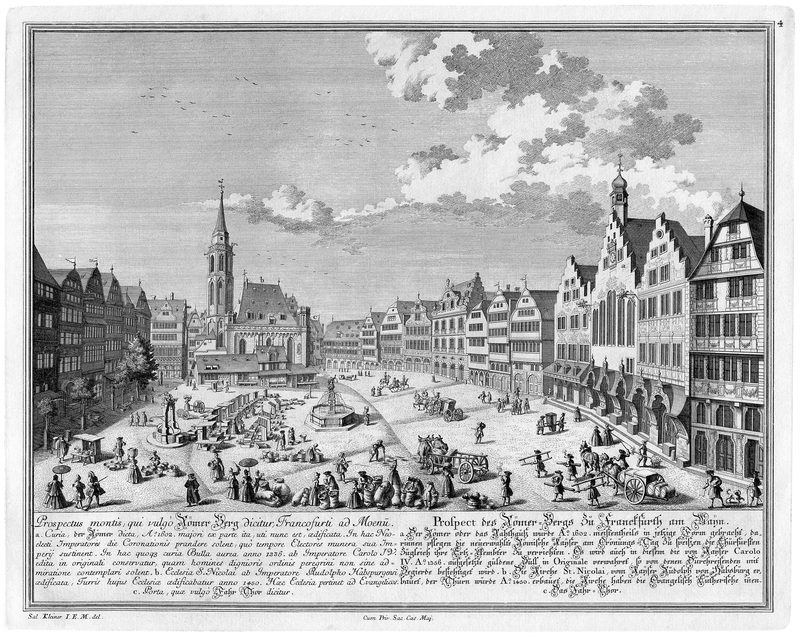 In 1721 – at the age of 40 – Telemann moved to Hamburg to assume responsibilities as Kantor of the famous Johanneum and musical director for the city’s five main churches. He remained there for the rest of his long life, as the most prominent musician in one of Germany’s most prominent cities. In 1722 he took on the directorship of the Hamburg Opera, which he continued to lead until it closed 16 years later. For the first two decades of his long career in Hamburg Telemann continued to compose and publish (he had begun publishing chamber music in Frankfurt) at a seemingly indefatigable rate. He published a vast amount of music – and even composed even more: the majority of his sacred compositions exist only in manuscript. He produced 44 publications between 1725 – 1740, many of them collections: for instance one single publication is a complete cycle of church music for an entire liturgical year: 72 cantatas! In the 1720s Maria Katharina had a very public affair with a Swedish military officer – at one point a satirical play about it was being produced in a Hamburg theatre which was stopped by the city authorities. By the 1730s she had left Telemann, saddling him with a huge gambling debt of several thousand thaler (more than his annual salary). Friends helped him cope financially and Händel even sent him a case of rare plants from England to console him (gardening was Telemann’s principal hobby). 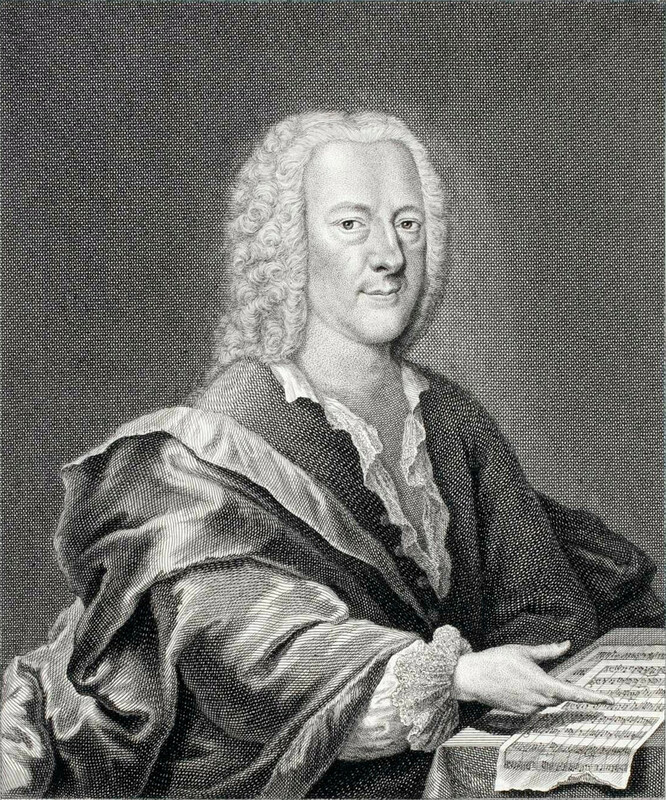 After 1740 – two years after the opera closed – Telemann published no more musical compositions but decided to concentrate on books of music theory instead – although this change did not preclude his continuing to write sacred compositions for his church obligations: Passions, music for memorials, civic ceremonies, and other incidentals. He began to slow down, although the pace at which he brought out new works was still faster than that of other composers. Towards the end of his life, beginning in 1755, he began to write oratorios again after the manner of his lifelong friend Händel (albeit in German). Telemann died at the age of 86 on June 25, 1767, having outlived Sebastian by 17 years and Händel by 8. 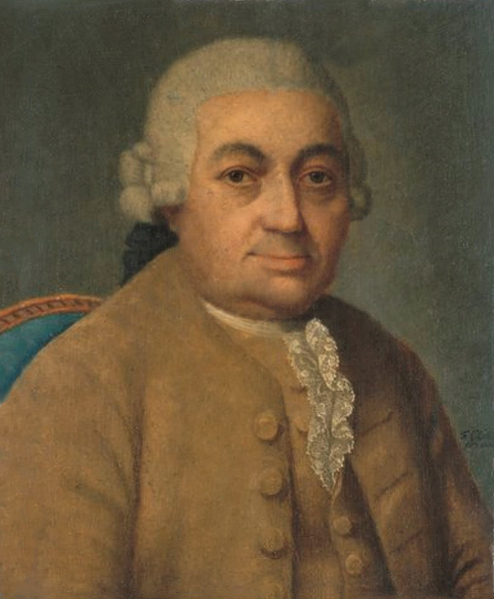 Carl Philipp Emanuel Bach left his post in Berlin to succeed his godfather as Hamburg’s principal music director. At the time of his death, Telemann had been the leading musician in the German-speaking world for half a century, but Haydn’s and Mozart’s careers were already off to strong starts and public tastes for the style galant and what would ultimately become the Classical style had begun to render the music of Telemann and his contemporaries fusty and obsolete. 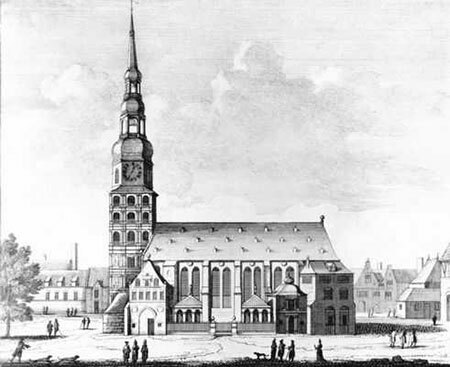 Katharinenkirche, 1700 – one of the five principal churches (Hauptkirche) in Hamburg. Copper engraving by Pieter Schenk . When Sebastian’s music was “rediscovered” beginning with the 19th century revival led by Mendelssohn in the 1820s, the reappraisal of the music of the past by musicians and scholars tended to view and judge Telemann’s music according to how well he fulfilled Sebastian’s musical ideals – and was found lacking. Telemann’s music was seen as facile and superficial, a general attitude that began to change in the 20th century but still persists although a great deal of Telemann’s music still remains unpublished and a complete appraisal of his oeuvre is yet to be done. German musicologist Max Schneider (1875-1967) and the Nobel prize-winning French writer, historian, and musicologist Romain Rolland (1866-1944) contended that Telemann is more appropriately understood as a forerunner of Haydn and Mozart than a second-rate J.S. Bach: his musical ideals were very different from Sebastian’s, and Telemann should be appraised according to his own ideals. This perspective began to change attitudes in the second half of the 20th century about Telemann’s music at least in historical performance circles – where performances of Telemann’s music are now common and a beloved part of the “canon” – if not in mainstream classical music. dozens of festal and occasional church music including cantatas, masses, psalms, motets, etc. Roughly a quarter of his works are believed lost, and many- especially sacred works – have still not been performed since the 18th century. It is for his instrumental music that Telemann is best known today. For instance, his Tafelmusik or Musique de Table, a subscription collection of chamber music issued in three parts in 1733, has been compared by many to Sebastian’s Brandenburg Concertos as a tour-de-force of compositional virtuosity that demonstrates Telemann’s ability to write for a wide variety of instrumental combinations. Tafelmusik showcases nearly every genre and style current at the time. Each of the three parts (“Productions”) consists of an overture, a quartet, a concerto, a trio, a solo, and a conclusion. The character of the music in Tafelmusik veers back and forth between French and Italian styles demonstrating Telemann’s ease with either. In this way Tafelmusik is akin to François Couperin’s Les goûts-réunis, ou Nouveaux concerts (The Styles Reunited, or New Concerts) published in Paris nearly a decade earlier in 1724. Subscriptions to Tafelmusik came from all over Europe, including one from “Mr. Hendel, Docteur en Musique, Londres”. Many of the works he published were intended to promote amateur music making at home. Telemann’s 12 Sonate Metodiche “Methodical Sonatas” for violin or flute and continuo published in 1728 and 1732 include two staves for the melody instrument: the top line denotes the unadorned melody and the staff below provides an illustration of how the melody might be embellished in performance. These sonatas are beautiful and intimate essays in chamber music, and they are also an invaluable tool today for understanding the improvisational aspects of late baroque performance practice. In 1728 Telemann and J.V. Görner founded Der getreue Musikmeister (The Faithful Music-Master), the first German language music periodical. Der getreue Musikmeister was another of Telemann’s many attempts to promote music-making as not only an activity performed by professionals in public ceremonies and concerts, but also as a leisure activity for the home. 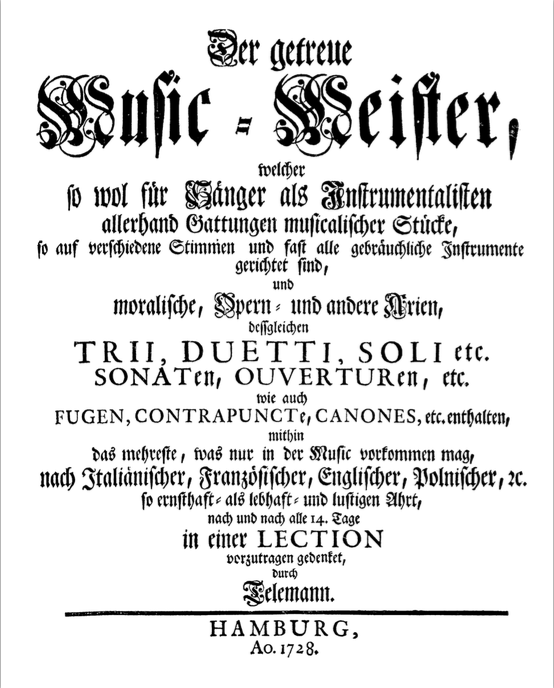 A four-page publication that appeared with new music every two weeks, the contents were composed by Telemann himself (of course) as well as other contemporary composers. Unfortunately it’s not known how long it circulated for – issues were not dated – but at least 25 are extant today. Telemann was a multi-instrumentalist. In his 1739 autobiography (he wrote three including two others in 1718 and 1729 – which do not agree on all points) he stated that he had learned to play harpsichord, organ, violin, recorder, oboe, flute, chalumeau, viola da gamba, double bass, and bass trombone, and he believed that an intimate knowledge of the instruments was essential for the composer. He left behind a wide array of music for many instruments, but his music holds a particularly special place in the repertoire for the recorder, and in the hearts of recorder players. Sebastian wrote parts for recorders in about a dozen of his cantatas, and – famously – in Brandenburg Concertos 2 & 4. Händel’s 6 sonatas for recorder and continuo are perhaps the finest works for the instrument from the historical repertoire. But Telemann – who played recorder himself and wrote with an intimate knowledge of the instrument’s idiosyncrasies – left behind more music for recorder than any other composer of the time, much of it of a very high quality. In addition, many of the works he wrote for flute or violin may also be played on recorder (a common practice of the baroque), augmenting the instrument’s repertoire considerably. For this reason, Telemann today is regarded by many not only as godfather to C.P.E. Bach, but as a sort of godfather to recorder players all over the world. By walterbitner in Baroque, Chamber Music, Choral, Early Music, Meet, Music, The Recorder on March 14, 2016 .